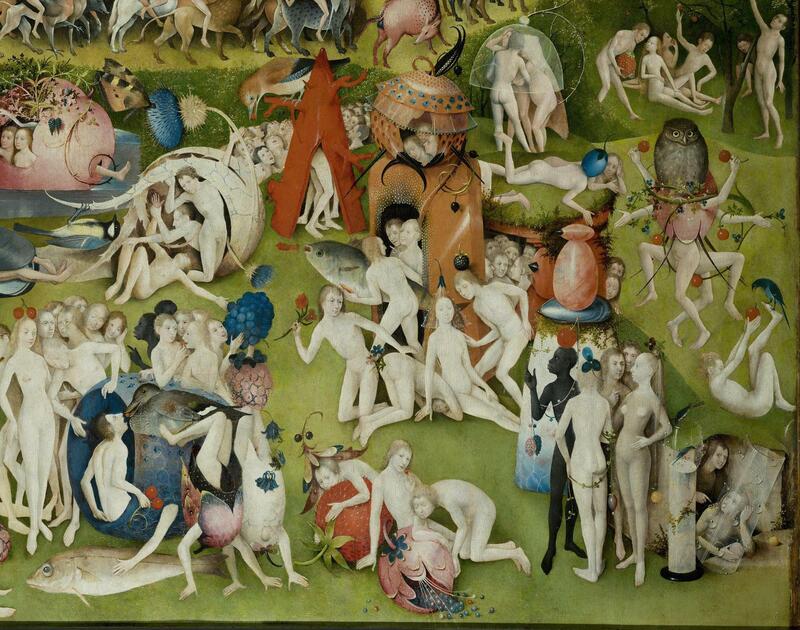 During the ‘High Art of the Low Countries’ programme on BBC4, the presenter Andrew Graham-Dixon discussed the painting ‘The Garden of Earthly Delights’ painted by Hieronymus Bosch. He remarked that the people holding strawberries were showing a recent discovery from America. Incorrect, as any art historian well acquainted with medieval paintings would know. Pictures of the Virgin Mary on a turf seat often the native European wild strawberry is growing profusely around her. 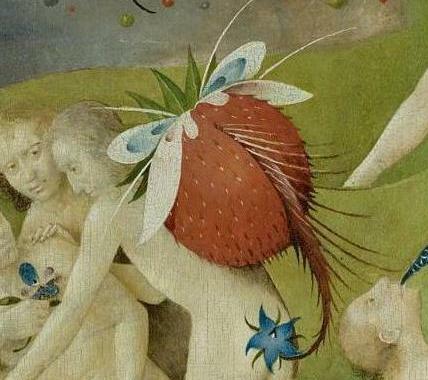 The Garden of Earthly Delights also shows cherries; both strawberries and cherries are the fruits that the worthy will eat in heaven. They are also the only fruits that were regularly eaten raw, dietary thinking of the medieval and early renaissance periods considered the eating of raw fruit unhealthy. What may have been more relevant concerning strawberries from America is that the newly introduced species bore larger berries than the European species. Whether this was of any concern to Hieronymus Bosch as he created his masterpiece is another matter. He is not really trying to show reality in his painting, even if everything that he paints, no matter how fanciful, appears to be life-like; one strawberry has an oddly shaped tail. Yeah, I picked that one up too Michael. Quite interesting to get a borage to grow in a strawberry, let alone flower!